Range of card designs available for customizing card back or both face and back. 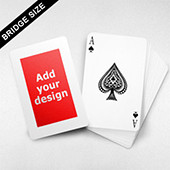 Custom bridge sized cards are the perfect choice for the gaming industry such as casinos as they are a little slimmer in width for easier handling. Measures 2.25 by 3.5 inches which is a quarter inch slimmer than poker sized cards. 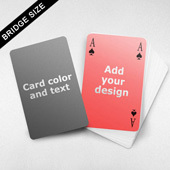 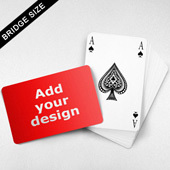 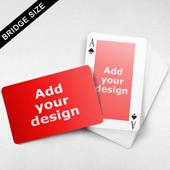 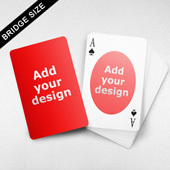 Our custom bridge playing cards comes with 2 choice of card quality. 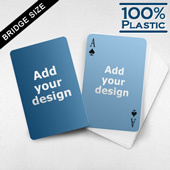 The 300gsm card has a smooth finish with a blue core centre which makes the card less see through even when shining a light through it. 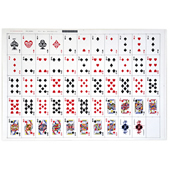 the 310gsm has a linen finish imported from France and has a black core centre layer meaning the card is completely non-see-through even when a high intensity light is shined through it. This is the ultimate in high standards that casinos use. Our bridge sized cards also comes shrink-wrapped as standard plus you can choose a variety of other packaging including plastic cases, plain tuck boxes or custom printed tuck boxes (for orders of 100 decks or more). 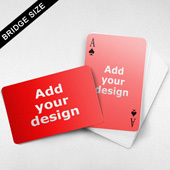 Depending on your needs, we have all the options to meet them. If you don't see what you need on our site, contact our experienced sales team who will be able to provide you with a customized solution. 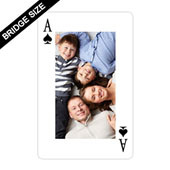 Bridge playing cards can be fully customized on the back and specific areas of the face area. Upload images that meet our minimum specifications as detailed on our product pages and on the online cards designer for high quality custom made bridge playing card deck. 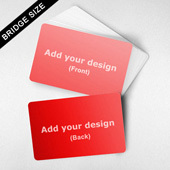 All images should be minimum 300DPI and include bleeding area. Once you've created your high resolution images, just upload them to our designer and use your mouse to drag and drop them to individual cards. 54 cards in a deck so you can use up to 54 images for card backs and 54 images for card faces if you choose to. 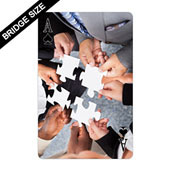 If you require more help, please contact us and we'll be happy to guide you through the process. We deliver your custom bridge sized playing cards to anywhere in the world via rushed shipment which will take as little as 2-3 days or standard shipment method which will take a little longer. 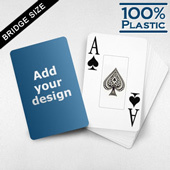 See our video at the bottom to see a sample of how your deck will look. Our playing cards comes shrink wrapped as standard and you can choose additional packaging to fit your needs. 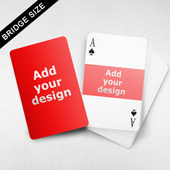 Here is another video to show how well our cards handle professionally.